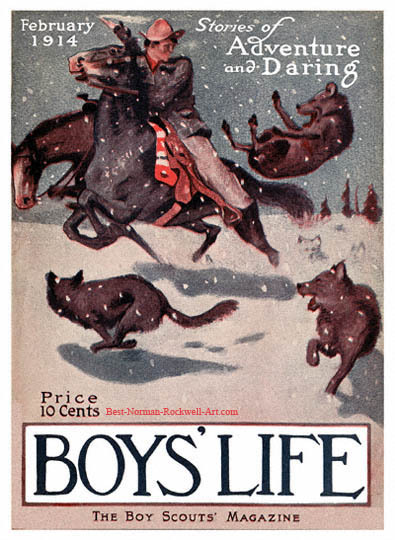 Scout on Horse with Wolves, this Norman Rockwell painting, appeared on the cover of Boys' Life published February 1914. This event marked Rockwell's sixth cover publication. Even before the Boy Scouts magazine had published this painting on its cover, readers had become familiar with him through his article and story illustrations. Boys' Life was a new publication at this time. The first issue was published on March 1, 1911. Part of the magazine's early success was due to its energetic young art director. Last month we were treated to a Boy Skating. This month it's more cold weather. After all, it is February. In this painting, we see a Boy Scout riding his horse in the snow. Actually, he has two horses. One is probably his supply horse. We do not know the whole story of why he and his horses are out in the snow alone. Except that they are not alone! They are being chased down by a pack of wolves. We can see three wolves in the foreground and two or three more outlined in the background. The Boy Scout and his horses are running as fast as four hooves will take them. Notice the breath streaming behind them as they go. Our Boy Scout would have no chance for escape, except for one thing. That little thing is a pistol. See the pistol, with gun smoke streaming behind, clenched in his right hand. See how one bleeding wolf is flying through the air! Also notice that one of the remaining wolves (on the right side of the painting) seems to be moving away from the quarry. That little pistol may have just saved the day.